Namysłów [naˈmɨswuf] ( listen) (German: Namslau) is a town in Poland, in Opole Voivodeship. Located along the Widawa (Weide) River, it is the capital of Namysłów County. Its population was 18,985 in 2007. Namysłów city budget income sources as of 2015. The town began to develop during the 13th century, but was destroyed in 1241 during the Mongol invasion of Europe. It was refounded by Duke Bolesław II the Bald in 1249. As Namslau, it was colonized by Germans during the medieval Ostsiedlung. Until 1294 it was part of the Duchy of Breslau, and from 1312–23 it was briefly the seat of an eponymous duchy. A castle, first documented in 1312, was a residence of King Casimir III of Poland in 1341. The Treaty of Namslau, in which Casimir renounced his claims on Silesia to King Charles IV of Bohemia, was signed in the town in 1348. The Gothic Church of SS Peter and Paul was built from 1405–41. Namslau was briefly an independent city during the 14th century and was enriched by the trade route from Breslau (Wrocław) to Kraków, especially with linen. The town was unsuccessfully besieged by Hussites in 1428. A privileged rifleman's guild was established in Namslau in 1434. Besides Breslau, Namslau was the only Silesian town which refused to pay homage to Ladislaus the Posthumous in 1453. As part of the Bohemian crown, the town passed to the Habsburg Monarchy of Austria in 1526. After a lengthy siege, Namslau was sacked by Swedish troops during the Thirty Years' War. In 1703 Leopold I, Holy Roman Emperor, granted the castle to the Teutonic Knights, who subsequently created a komturei. Namslau passed to the Kingdom of Prussia in the 1742 Treaty of Breslau. During the Seven Years' War, it was occupied by Austrian and Russian troops. The town was occupied by French troops from 1806–07 during the Napoleonic Wars; the castle was secularized in 1810. 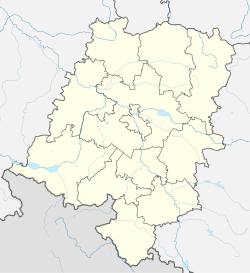 Namslau became part of the new Prussian Province of Silesia in 1815 and was administered within Kreis Namslau, Regierungsbezirk Breslau. The town became part of the German Empire in 1871 during the unification of Germany. Namslau began to develop rapidly during the 19th century. The first newspaper within the town was founded in 1846, and Namslau was connected with Breslau by telegraph in 1862. It was connected by railway to Breslau and Kreuzburg (Kluczbork) by 1868 and to Oppeln (Opole) by 1899. One of the most well-known companies in the town was Brauerei Haselbach. In 1862 the brewer August Haselbach acquired the castle brewery, built in 1538; he purchased the castle in 1895. The industrial brewery was used as the model for other Haselbach breweries throughout Germany. During World War II, the Nazis erected a subcamp of Gross-Rosen concentration camp near Namslau. On 21 January 1945 the town was conquered by the Red Army, leaving most of the buildings destroyed. Reconstruction of the old town began after the war, but the Protestant church, completed in 1789, was leveled in 1963. The coat of arms of Namsłów depicted a black eagle on a yellow field, with an escutcheon of three red roses; the eagle's tail ended in a red star. These arms were similar to those now used by Namysłów County. 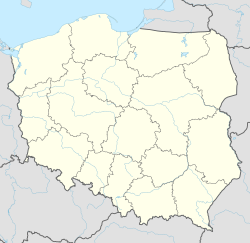 With the town's transfer to Poland in 1945, its arms were changed to depict the top half of a Silesian eagle above a red star on a yellow field. Wikimedia Commons has media related to Namysłów. Portal Namyslowianie.pl Local News Service in Namyslow.